How can you use white papers to generate leads? One of the differences between this document and other types of sales materials is that person who reads it tends to be involved in decision-making. In other words, whereas others sales documents are targeted at customers, journalists, PR, or other sales professionals, white papers are frequently read by those in the Executive level. 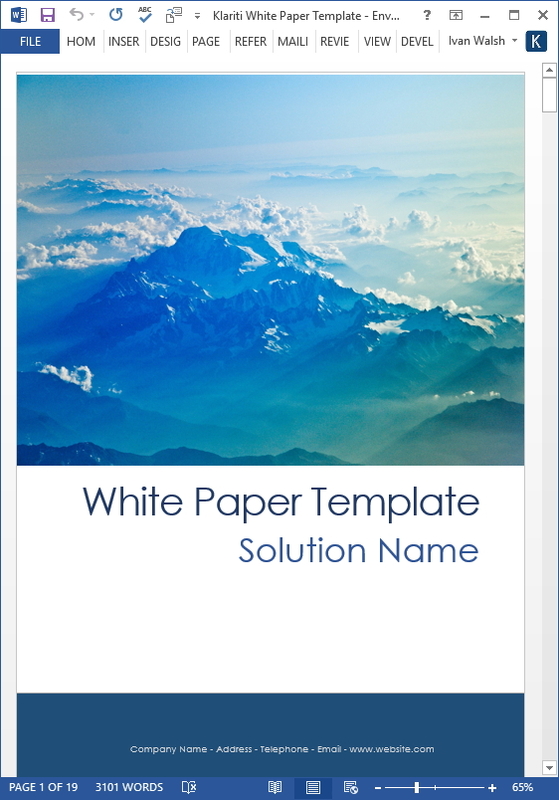 15 royalty-free MS Word White Paper templates. For this reason, you can use white papers to fast-track the decision making process and connect with these individuals faster. Here’s how to do it. Recently we discussed White Papers and their effectiveness in generating business leads. You might be interested in the following statistics, as they illustrate the returns you can generate from a well-crafted white paper. While working on a recent consultancy project, we prepared a short 5-page white paper as the main source of lead generation. As budgets were tight we focused on writing a short, high impact document. We wrote it in two days and then published it online. Only minimal registration (email address only) was required to download it. We used social media channels to highlight awareness and created a specific landing page for the signup. The response was better than we expected, with many sign-ups in the first 48 hours. Once the registration details came in, our Sales Team took it from there and followed up the leads as fast as possible. Less than 3 weeks after publishing this white paper, our lead flow had increased from 25 leads per month to 280. If you know your product’s strengths, and your customers’ pain points, they will want to read how your white paper solves their problems… especially when you write about a niche industry or service. White papers require an investment in research and writing time. White papers work well if you have a unique product with information your clients don’t have. Create a unique angle that makes your white paper standout. Make it easy for prospects to register for the download. Don’t ask for too much information upfront. The email address is the main item to capture. Don’t make it too long. Five to ten pages is fine. Next, be selective about who you chose to write the paper. Think of your white papers as ‘strategic’ sales documents. Engineers can’t write these. Don’t ask them-it’s not fair for you or them. They can contribute to the technical details, but you need to have an experienced writer managing the overall delivery and coordinating all resources involved. If, you do have experience in writing, it shouldn’t take a lot of your time. Most experienced writers should be able to compile a white paper with sufficient source material and access to specialists who can answer questions. Identify the theme of the white paper. Identify who can help me gather information and answer questions. Get access to any documentation, images, or collateral you may need. Create an outline; describe the main points and conclusions. Schedule the document creation process, e.g. how you will create the document over the next 5-10 days. Identify who will review the document. Confirm what format the white papers needs to be delivered in, for example, RTF, PDF, ePub. Confirm who will signoff the document once it’s finished. Choose the subject matter that is the easiest to write about, and will generate the most interest from your customer base. When writing your white paper, use a light conversational style… as if you were talking to a friend sitting next to you. Though the white paper may indirectly promote your product or services, the sales angle is hidden in the helpful, useful information that you are providing to your readers i.e. prospective clients. White papers help build credibility and have a long shelf life. Decision-makers use them as a reference. Include a section at the end of the document about the authors (this makes it more personal) with contact information, 1800 telephone numbers and email address. Once you’ve written the article, get a reliable person to check the grammar and spelling. Make sure it’s clear, concise, and to the point. Then, leave it aside for a day or two. When you return to it later in the week, you’ll have some distance and be able to see where it needs adjusting. Now, you’re ready to use it for promotion – and that’s what we’ll talk about next week.